The Heritage Walk in Ahmedabad starts on a cool morning from the Swaminarayan Temple and takes you around the lanes and Pols of the Old city area as the sun starts to move higher. Centuries old houses in Pols, or closed neighbourhoods carefully designed to protect the inhabitants from the elements and even from each other stand quietly among the buzzing activity of forenoon. 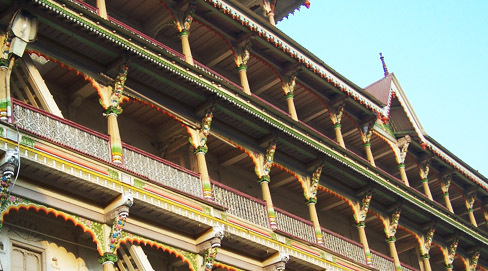 Within these enclosed Pols which are as old as the city of Ahmedabad itself, are the most beautiful examples of wood carving, some which are hundreds of years old. Thisancient art of carving animals and birds, gods and mythical creatures on the doors, balconies, pillars and brackets of houses is one of the many crafts that Gujarat takes pride in. 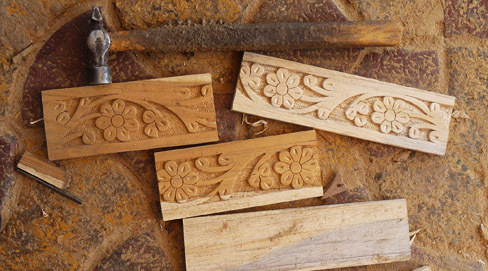 Today, many craftsmen still engage in the art of carving solid wood to create ornamented furniture. A stretch of road just South-West of the Walled City, lined with wood workshops, seems like any other cluster where craftsmen carry on the legacy of wood carving that is special to Gujarat. But here, this 12th century craft is continued not by locals, but craftsmen who migrated here from Delhi, some 15 years back. A growing population and rising cost of living coupled with increasing competition compelled them to look for patrons for their trade in a less ruthless place. 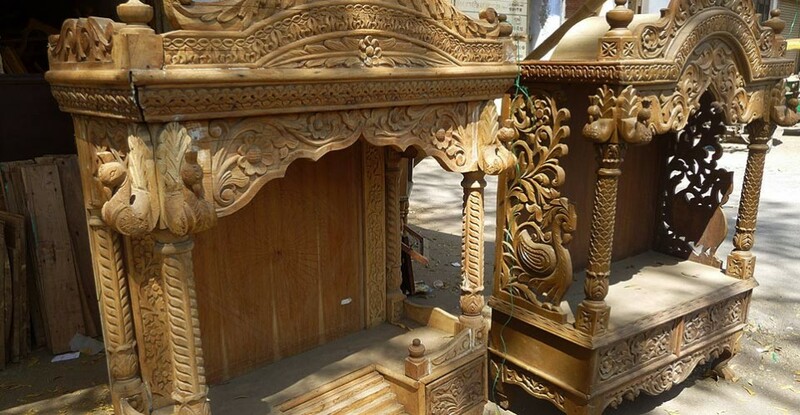 The shop owners and craftsmen have now established themselves as experts in richly carved wooden furniture, most of which istypically Gujarati in style. 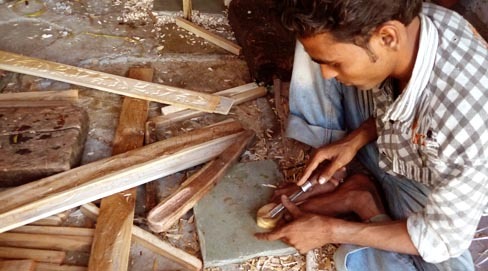 Sagwan, a variety of Teak wood, is procured from nearby states Madhya Pradesh and Maharashtra. The planks are cut into the required sized pieces on an electrical powered jig-saw machine. Smoothing them with a planar makes them ready for further work. Curves and other shapes are also cut on the machine with a lot of careful maneuvering. 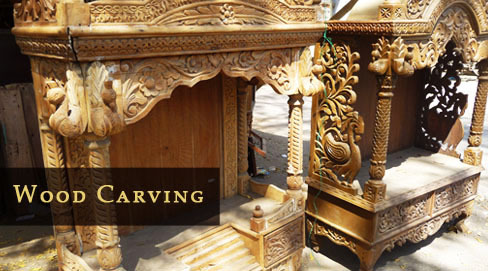 The designs to be carved are made by the head craftsman, who is also usually the shop owner. He adds in some Mughal style flowers and vines to Gujarati parrots, peacocks and elephants to create a unique cross cultural style of motifs. 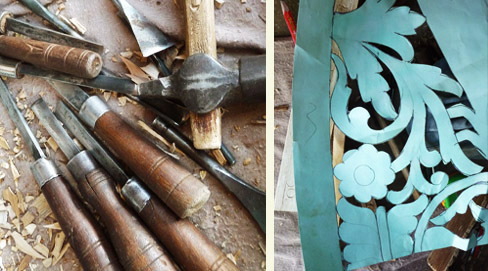 The artisans trace these paper stencil designs on wood and then lightly engrave over the outlines. After this, they start engraving and chipping away excess wood with chisels, flat and curved, and of different sizes to reveal designs in three dimensions. Floral designs in the foreground and stippling with narrow chisels to give a texture in the background to bring out the motifs. Sometimes, cutting away the entire background and leaving only the motifs creates a beautiful Jali like structure that plays with light and shadow. 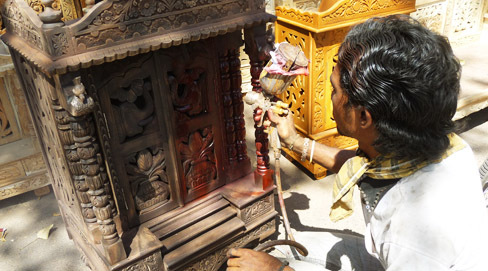 Steel rulers, L-scales (Chaurasi) and dividers (Purkaar) are the measuring tools, while hammer and nails and carpentry skills of two to three craftsmen together assemble the plain and intricately carved pieces of wood to buildtemple shrines, swings and furniture. Final polishing and a spray of varnish give the furniture a smooth shine. Many crafts and arts see an intermingling of cultures and religion and this wood furniture market is one such exemplar of harmony and beautiful co-existence. 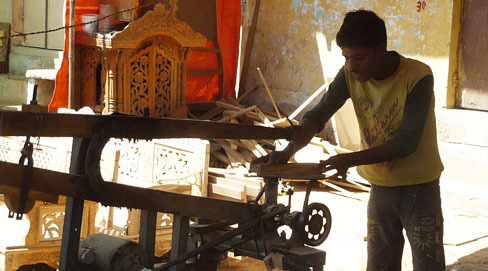 How else would one describe a group of Muslim craftsmen specializing in Hindu temple shrines? I want to purchase a temple for my home. I am an ordinary person please let me know some samples and prices over photo. I want to purchase the sagwan tempe for home. Provide designs and dimensions as well as cost of the same.